Active community outreach and involvement is vital to the success of any major infrastructure project. Collaboration between different levels of government may be required to successfully deliver large infrastructure. Sharing of risks beyond the control of either party can have a positive impact on the working relationship between the parties. Involving the operations contractor during design and construction can assist from an operational perspective to ensure operations KPIs are understood and achievable. Early discussions on the interpretation and practicality of operations KPIs with the operations contractor can make for a smoother transition between construction and operations and help to avoid misunderstandings. Upfront consideration of significant construction and financial risks through the establishment of a contingency fund enabled a satisfactory outcome after the risks materialised during the construction period. There are some risks, which although allocated to the Project Company under the PPP contract, will still need to be closely managed by the Procuring Authority to avoid reputational damage. Both parties may need some time for adjustment between the construction and operations phases to settle into managing the operations phase obligations. Frequent (even weekly) meetings with all relevant stakeholders can assist the Procuring Authority to keep a close watch on the construction activities and manage any potential challenges. Dispute Resolution Boards may be costly to set up, however, they can also be an effective way of settling disputes and have the advantage of reducing the risk of litigation. The Port of Miami Tunnel is one of the first public-private partnership (PPP, generally referred to as P3 in North America) projects in the State of Florida. The Port of Miami had only one access point through the city of Miami and was the cause of major traffic congestions in the city. A solution was needed to divert the incoming traffic away from the city centre. The solution was to connect the interstate network with the port through a tunnel. This would divert incoming traffic from the network away from the city. Being one of the early PPP projects in the State of Florida, the Procuring Authority, the Florida Department of Transport, did not have significant experience in managing PPP contracts. In addition, the state and city could not provide the financial contribution necessary for the project. The support needed for the realisation and success of the project was provided by the federal government. The Florida Department of Transport provided all the technical, legal and financial expertise needed to manage and deliver the project. The Federal Highway Administration provided a loan of over USD $340 million out of its Transportation Infrastructure Finance and Innovation Act (TIFIA) credit assistance programme. As a result, the significant federal support in combination with the state, county, and city local knowledge ensured the success of the project. Despite challenges faced in unforeseen ground conditions leading to a dispute, the project was completed ahead of schedule and under budget. The Port of Miami is located on an island in Biscayne Bay between the cities of Miami and Miami Beach. Before the construction of the Port of Miami Tunnel, the only access to the port was via a single bridge between the island and the city’s central business district (shown on the bottom left of Figure 1). Over 16,000 vehicles were using the roads surrounding the port every day, with cargo trucks making up a quarter of that number. With the expansion of the Panama Canal due to be completed in 2015, as well as the Port of Miami acting as the “cruise capital of the world”, it was clear that better access was required. Congestion was inhibiting the operations of the port, and the commercial growth of the city. This was exacerbated by the traffic patterns of Miami, where congestion is an issue not just during weekday rush hour, but also in the evenings and on the weekends during peak nightlife hours. By connecting the port directly to the interstate network, a tunnel would help remove up to 1.5 million trucks per year from the roads in the downtown region of the city. It was partly for this reason that it was decided not to toll the tunnel; applying user fees would have introduced the risk that some drivers would avoid the tunnel and continue to use the existing bridge. A tunnel had been considered by the region’s planners as early as 1982, however, it entailed substantial risks. It would have to be built 40 metres below sea level, under a busy shipping channel and in an environmentally sensitive area with uncertain geotechnical conditions. The project would in fact include two tunnels (one for each direction of traffic), as well as improvements to the connecting causeway and port roads. A PPP model was decided to be the most appropriate procurement model to ensure value for money for the state, as it would best allow the transfer of construction risk to the private sector. Additionally, given the economic uncertainties and hardship due to the Global Financial Crisis, the state was reluctant to take on a large amount of debt to finance the construction of the tunnel. 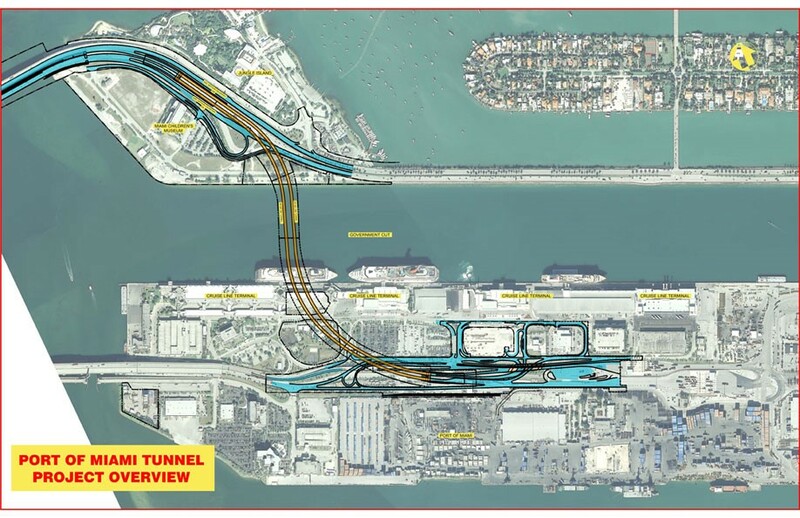 Figure 1: Port of Miami Tunnel "Yellow"
In the years leading up to financial close of the Port of Miami Tunnel project, the local county had agreed to spend USD $347 million on a new baseball stadium with significant scepticism from the public. The agreement was and is still controversial, with the real costs, including cost of borrowing, being argued to be higher than published. As a result, government expenditure on construction was expected to be scrutinised more closely, especially on a high-profile project such as a new tunnel. This reinforced the need to prioritise community engagement and inclusion, particularly during the high-risk construction phase. There was a great emphasis on the need to include the local community in the benefits of the project. This project was tendered in the heat of the Global Financial Crisis, with the Florida Department of Transport selecting a consortium, Miami Access Tunnel, as the preferred bidder in 2008. The majority equity investor at that stage was Babcock and Brown, who went bankrupt before financial close. Meridiam subsequently joined the consortium as the majority equity investor to replace Babcock and Brown and financial close was reached with the Project Company, MAT Concessionaire, LLC, in 2009. The construction process for the Port of Miami Tunnel was always going to be challenging, as the MacArthur Causeway Bridge (to which the tunnel was due to connect) could not be shut down, and the port itself also needed to remain in full operation. The tunnels were the first tunnels in Florida to be completed using a tunnel boring machine (TBM), which has substantial upfront costs. The first tunnel took eight months to complete, which was longer than originally planned, due to unforeseen geotechnical challenges. A large amount of coral stone, a hard material similar to granite, slowed down the boring from the start. However, more significantly, 30 metres below sea level the construction contractor encountered voids filled with a semi-liquid slurry which, in some locations, were the size of a city block. It was not possible to bypass the voids, nor leave them filled with the slurry. The solution to this challenge was to pump approximately 200,000 cubic metres of concrete into the voids, allowing the TBM to tunnel through a stable material. A contingency fund had been put aside by the Procuring Authority and the Project Company to cover additional costs due to geotechnical issues, and this was used to pay for this extra work. However, agreeing to reimburse the Project Company in recognition of the additional costs led to a dispute. This is described in further detail under the heading “Key Events” below. There were multiple work-fronts open at the same time, so the construction contractor was able to reschedule and optimise its work and mitigate the delays caused by the challenging ground conditions. A final tunnelling challenge to be addressed was the existence of groundwater, which threatened to disrupt the construction of cross passages between the two main tunnels. To avoid water pouring into the space that was being dug out, the construction contractor had to freeze the area to -30 degrees Celsius and keep it cold for 40 days to give the salty water time to harden. Regardless of the challenges faced during construction, effective management of the construction phase and collaboration between the key parties resulted in completion of the project ahead of schedule and under budget. The construction contractor also faced some challenges in terms of having a full understanding of and compliance with federal laws and regulations, particularly labour laws. It is very important that the Procuring Authority ensures that the Project Company and its contractors are fully aware of the federal laws affecting the works. Regardless of the risk allocation, serious violations of labour or safety laws will have a negative impact on the project and all parties involved from a reputation point of view. The Procuring Authority was also liable for fines if any of its projects were not compliant with relevant laws and regulation. In this project, the construction contractor hired a labour union company to assist it in complying with the federal labour laws. The tunnel began operations in August 2014, almost five years after financial close. Approximately 14,000 vehicles use the tunnel each day, and an estimated 80% of port-related truck traffic has been diverted away from the central business district. A number of operational innovations were introduced to the project to improve traffic flow and user safety. An automatic incident detection system scans the roadway for atypical events, such as a stopped vehicle, and then alerts workers. The tunnel’s internal surfaces are fireproofed, and a deluge sprinkler system was installed to suffocate any fires. A system of sensors and alerts exists to warn oversize trucks not to enter the tunnel, including infra-red scanners, ship horns and emergency messages. Additionally, there are floodgates at each entrance, which can completely seal the tunnel off from a storm surge. The operations have so far been free from fatalities, and in July 2015, the project received the 2015 Infrastructure Project Award from the National Council for Public-Private Partnerships. The KPIs for this project are around lane availability, incident detection and response time, maintenance, lighting, vents and safety features. The operations contractor was actively involved during the design development and construction phase, which allowed it to suggest improvements and ensured that it was satisfied that the proposed design would meet the availability and performance standards. As part of this engagement, KPIs were also reviewed in terms of their practicality from a performance standards point of view. The engagement of the operations contractor in this process was quite important to ensure the practicality of the operations obligations. Construction performance is monitored by two third party consultants, supporting the Procuring Authority’s team: a Construction Engineering Inspection (CEI) consultant, and the owner’s (i.e. the Procuring Authority) representative. These consultants submitted regular monthly progress reports and have attended regular progress meetings with the Project Company and the construction contractor. The Procuring Authority did not have the relevant operations and maintenance expertise on tunnels and it therefore had in place an operations and maintenance oversight contract with relevant third parties to help with independent performance monitoring and contract management. The Procuring Authority’s team conducts spot checks of performance standards, reported failures and the workings of the operations control room. The Procuring Authority found the first three months of the operations phase to be the most challenging, as they presented a learning curve for both the Project Company team and the Procuring Authority team. During this period, many operational procedures and staffing requirements were adjusted to suit actual conditions. The payment mechanism for the Port of Miami Tunnel is split between milestone payments for the construction phase and ongoing availability payments during the operations phase, both paid by the Procuring Authority. The availability payments were set at USD $32.5 million a year, not including inflation adjustments or deductions. During construction, external consultants were hired by the Procuring Authority under an owner’s representative contract and a CEI contract. In addition to verifying compliance with the design, quality of works and overall progress (which was independently done by the CEI team with on-site presence), the owner’s representative was responsible for certifying milestone payments to the Project Company. Availability payments for the operations phase were set at a maximum annual payment. The payments are broken down into monthly unitary availability payments. Deductions attached to certain KPIs are enforced through a performance-points calculation, which are also linked to the events of default and termination. The availability payment largely consists of the operations and maintenance (O&M) fee, fixed for 30 years with inflation adjustments. The objective is to ensure the asset’s condition would meet the required specification throughout the duration of the contract and at handback. The parties agreed to share the risk of changes in O&M insurance costs, as these were seen to be dictated by global trends outside the control of either party. Savings made or additional expenses incurred on these premiums by the Project Company arranging the insurance cover are shared with the Procuring Authority. One of the clear strengths which has led to the success of this project is the ongoing community engagement, which was carried out by the Project Company. This was particularly important given the public criticism over the recent construction projects, which were seen to disadvantage local residents, and also because this project had a high profile in the city and a wider region. The primary method in which local support was encouraged was through Operation 305 (referring to the local area code), which was a commitment to not just hire people from the local area, but also to source materials from local vendors. Approximately 83% of staff positions went to people from the county, and 400 locally-owned businesses were involved in the development of the tunnel. The Project Company’s team also put a lot of emphasis on community outreach, developing traffic management plans in association with local authorities to balance the demands of locals with those of the construction activities. Project Company representatives visited local schools to assist with Science, Technology, Engineering and Maths (STEM) activities, and have continued this into the operations phase. The TBM was even named Harriet by a local girl scouts group, after the 19th century abolitionist Harriet Tubman. Finally, the excavated material from the tunnel was deposited over landfill to create a recreational area on a nearby island. The ongoing focus on the community is seen by all parties as an important enabler of success. The relationships between governments at different levels are vital to the ongoing success of this project. This began in the project structuring phase, where funds were provided by federal, state, county and city sources, with the City of Miami also granting land access. The USD $150 million contingency fund set up by the Procuring Authority to mitigate the risk associated with unforeseen ground conditions was jointly funded by the Procuring Authority and the Miami-Dade County. The promise of ongoing funding to the Procuring Authority is particularly important given the decision not to impose tolls, as this increased the amount of money required from the government. The Procuring Authority executed a funding agreement with the city and county, but these authorities had no direct oversight over the project. The programme’s main goal is to assist in improving transportation infrastructure in the US and close the increasing gap by attracting and enabling private participation. The programme does not provide a grant to states and cities; it offers loans with favourable terms to assist in securing the required capital from the private sector. The programme’s flexible loan repayment terms allow the delay of repayments for up to five years after substantial completion. The programme also provided credit guarantees to lenders and offers standby lines of credit to assist with project cash flows. During the construction phase, the Procuring Authority’s team reached 21 at the peak of the works, which was reduced to six as the construction phase came to an end. The Procuring Authority appointed one person to manage the PPP contract, with the authority and flexibility to recruit the internal and external Procuring Authority resources needed. As the Procuring Authority did not have substantial tunnelling experience, it relied on the expertise of the CEI consultant and the owner’s representative. At the start of operations, two full time staff members were appointed, and one was part time. Once the team became more familiar with the operations phase, the team was reduced to one full time employee and one part time employee. No structured PPP training was given to the Procuring Authority’s contract management staff, however they gained relevant skills through “on the job” training. The level of communication between the Procuring Authority and the Project Company stakeholders during construction was seen as beneficial to the project, particularly during periods of disagreement. Weekly meetings were held which included the Procuring Authority, the Project Company and the construction contractor, as well as representatives from city and county governments. These meetings were focussed on day-to-day issues arising. This helped the Procuring Authority keep a close watch on the construction activities and helped mitigate the delays caused by disputes and challenging geotechnical conditions. In addition, there were monthly and quarterly meetings between the Project Company and Procuring Authority focussed on matters of strategic importance and any issues escalated from the weekly meetings. During the claim settlement period, quarterly meetings between the Procuring Authority and the Project Company were also joined by representatives from the city and county. The Procuring Authority had an internal, department-wide document control system in place. The PPP contract did not prescribe any specific information management system. However, the owner’s representative introduced software which facilitated document control and management during construction, which was considered an improvement on the system that the Procuring Authority had in place. All parties had access to this system to submit and upload documents for the contract management team to review and approve. The geotechnical challenges encountered, in particular the existence of soft voids in the rock, led to a dispute over the additional costs of pumping in extra concrete (i.e. grouting) to allow tunnelling to continue. A contingency fund had been created as part of the PPP contract as a way of sharing the risk of increased tunnelling costs. The risk was shared by structuring the overall contingency fund in a way so that the Project Company would be liable for the first USD $10 million of additional costs, then the Procuring Authority would be liable for any costs above USD $10 million up to a total of USD $150 million. Where cost overruns exceeded USD $160 million, the Project Company would be liable for another USD $20 million. If USD $180 million was exhausted, the parties would have the right to terminate the contract. The PPP contract also specifically allowed for 8,000 cubic yards (6,116 m³) of concrete for grouting. However, due to the soft ground conditions (including the voids), an additional 250,000 cubic yards was required. As a result of a claim by the construction contractor, the Project Company submitted a claim to the Procuring Authority for the costs of pumping in additional concrete. This was, however, disputed by the Procuring Authority. As no agreement could be reached on the cause of the claim, nor its value, the claim was escalated to the project’s Dispute Resolution Board (DRB), which decided in favour of the Project Company and the construction contractor. However, the DRB’s decision was only on entitlement for compensation and not the amount, which was later negotiated between the parties. The value of the settlement figure was well below what the overall contingency fund allowed for the project, and the Procuring Authority was satisfied with this outcome. The contract did not provide for arbitration as a dispute resolution mechanism, and disagreements are generally escalated to the DRB if negotiations fail to resolve the dispute. The DRB is still used regularly on the project by the parties as a way to resolve disputes. It is costly to set up, however the parties have found it to be an effective way of settling disputes and it has the advantage of reducing the risk of litigation. The DRB also helps with dispute avoidance when used as a regular tool on this type of project. The parties meet with the DRB on a regular basis to discuss potential issues that could become disputes. These meetings are a forum for the Project Company and Procuring Authority to proactively resolve issues before they escalate into disputes. Support from the local community is vital to the success of any major infrastructure project, especially in an environment where PPPs may be subject to increased public scrutiny and possibly be perceived as controversial. In the Port of Miami tunnel project, both parties made it a priority to pro-actively involve the local communities in the project and use the project to address their needs. The parties agreed that in order for the project to succeed, it needs to have a notable impact that can be felt by the local community. As a result, the community engagement plan went beyond just media and public relations into delivering real economic, social and commercial benefits. Train and hire labour locally and use local contractors. With the plan in place, the project managed to address the local community’s social and economic concerns, and the challenges of their daily lives. A comprehensive traffic plan made in collaboration with the cities of Miami and Miami Beach ensured minimum effect on commuters. The inclusion of local programmes like the girl scouts and involvement in science, technology, engineering, and mathematics education mentorship helped the community with its social improvement initiatives. Finally, by upskilling local labour and the use of local contractors, the community was able to share in the economic benefits. The involvement of governments at four different levels (federal, state, county and city) was vital to the success of this project, from the structuring and signing through to implementation and operation. Joint funding and ongoing engagement and political support from different public bodies helped overcome challenges in construction, as well as improved community engagement. It was recognised by both parties in this project that risks associated with O&M insurance cost changes are affected by global trends beyond their control. The risk was addressed proactively by both parties agreeing to share savings or cost increases in the premiums. This approach ensured a fair and optimised risk allocation and helped the relationship between the parties. The operations contractor should be involved during the design development and construction phase. As the party with the most expertise in operations, it will be able to suggest improvements which can reduce whole of life costs and help the service to be delivered to a high level. The structure of the PPP contract should incentivise the Project Company to do this regardless, however it is still important for the Procuring Authority to ensure it takes place. This may have more relevance if the operations contractor is not an equity investor in the Project Company. There may otherwise be a tendency for the considerations of the construction contractor to outweigh operational demands. In this project, the operations contractor was involved during the design and construction phase, which allowed it to highlight design deficiencies early enough for them to be rectified. It is important that the parties reach agreement early on what each KPI means from an operational point of view, and how it will be measured. Agreement on the interpretation of the KPIs is key to minimising disputes relating to performance evaluations during the operations phase. On this project, the operations contractor, in collaboration with the Project Company and the Procuring Authority, started reviewing the KPIs one year before the start of the operations phase to assess their achievability and predict any challenges. The main issue that the operations contractor raised was regarding incident response times. The Procuring Authority had made this a priority, however, based on the final design there was a question over whether the KPIs were achievable. The Procuring Authority managed this by analysing the resources that the operations contractor had described in its operations manual and assessing whether its concerns were valid. The Procuring Authority concluded that the KPIs for dealing with a breakdown of a large truck were too onerous, given that it would be difficult to bring a certain size of tow truck into the tunnel. The timings for this were then adjusted, while all other KPIs remained as prescribed in the PPP contract. Although in many PPP projects involving construction works the majority of the construction risks are allocated to the construction contractor, tunnelling projects can present particularly high risks in terms of unforeseen ground conditions, delays and cost increases. In this project, although a dispute occurred with respect to unforeseen ground conditions, the availability of a contingency fund enabled a successful outcome that was acceptable to both parties and the delivery of the project. The construction contractor faced some challenges in terms of its full understanding of and compliance with federal laws and regulations, in particular labour laws. It is very important that the Procuring Authority ensures that the Project Company and its contractor are fully aware of the federal laws affecting the works. Regardless of the risk allocation, serious violations of labour or safety laws will have a negative impact on the project and all parties involved from a reputation point of view. The Procuring Authority was also liable for fines if any of its projects were not compliant with relevant laws and regulation. In this project, the construction contractor hired a labour union company to assist it in complying with the federal labour laws. At the start of operation, two full time staff members were appointed by the Procuring Authority and one was part time. Once the team became more familiar with the operations phase, the team was reduced to one full time employee and one part time employee. The level of communication between the Procuring Authority and the Project Company stakeholders during construction was seen as beneficial to the project, in particular during periods of disagreement. Weekly meetings were held which included the Procuring Authority, the Project Company and the construction contractor, as well as representatives from city and county governments. These meetings were focussed on day-to-day issues arising. This helped the Procuring Authority to keep a close watch on the construction activities. Dispute Resolution Boards may be costly to set up, however they can also be an effective way of settling disputes and have the advantage of reducing the risk of litigation. A Dispute Resolution Board (DRB) was set up to resolve a dispute between the parties related to geotechnical challenges encountered by the construction contractor during tunnelling. The DRB is still used regularly on the project by the parties as a way to resolve disputes. It is costly to set up, however the parties have found it to be an effective way of settling disputes and it has the advantage of reducing the risk of litigation. The DRB also helps with dispute avoidance when used as a regular tool on this type of project. The parties meet with the DRB on a regular basis to discuss potential issues that could become disputes. These meetings are a forum for the Project Company and Procuring Authority to proactively resolve issues before they escalate into disputes. The I-495 Express Lanes PPP (generally referred to in North America as P3) project consists of the construction of two additional high-occupancy toll (HOT) lanes. The Daang Hari-SLEX Link Road, locally known as Muntinlupa-Cavite Expressway, is a 4km 4-lane toll road project.